¹ Region with no counties. A shire county is a non-metropolitan county that has multiple districts. Its name does not need to have shire in it. The term shire county is however unofficial. All, apart from Berkshire, have county councils. Sometimes shire county is used to exclude Berkshire, because it has no county council. The counties have populations of 109,000 to 1.4 million. Under local government reforms coming into effect in 2009, the number of such counties was reduced. 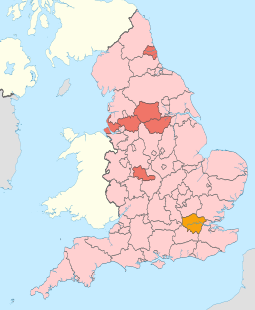 The non-metropolitan counties of Bedfordshire and Cheshire were split into two separate non-metropolitan counties respectively, while Cornwall, County Durham, Northumberland, Shropshire and Wiltshire became unitary authorities each of a single district. Unitary authorities are areas with only one council, and there are 55 in total. 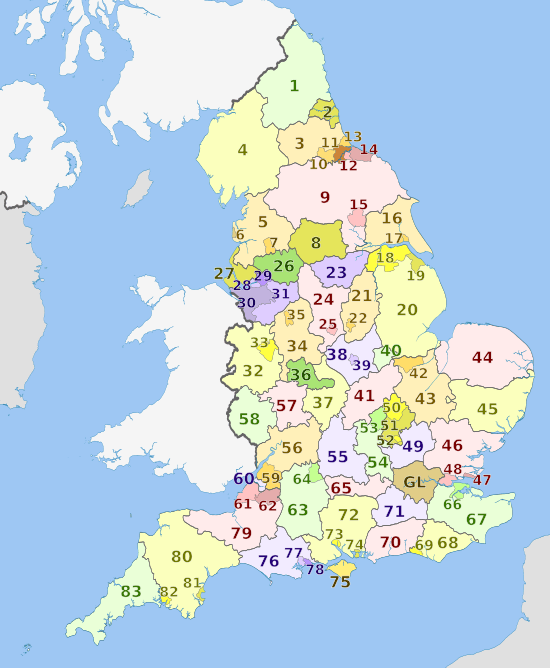 49 are coterminous with a non-metropolitan county: 43 (Bath and North East Somerset, Bedford, Blackburn with Darwen, Blackpool, Bournemouth, Brighton and Hove, Bristol, Central Bedfordshire, Cheshire East, Cheshire West and Chester, Darlington, Derby, East Riding of Yorkshire, Halton, Hartlepool, Herefordshire, Kingston upon Hull, Leicester, Luton, Medway, Middlesbrough, Borough of Milton Keynes, North East Lincolnshire, North Lincolnshire, North Somerset, Nottingham, Peterborough, Plymouth, Poole, Portsmouth, Redcar and Cleveland, Rutland, South Gloucestershire, Southampton, Southend-on-Sea, Stockton-on-Tees, Stoke-on-Trent, Swindon, Telford and Wrekin, Thurrock, Torbay, Warrington, York) of these are defined as counties with a single district council and no county council; the other 6 (the Isle of Wight, Cornwall, Durham, Northumberland, Shropshire and Wiltshire) are technically counties with a county council and no district councils, but the effect is the same. The remaining 6 unitary authorities (West Berkshire, Reading, Wokingham, Bracknell Forest, Windsor and Maidenhead, Slough) are districts of Berkshire, however they are not non-metropolitan counties, as the non-metropolitan county of Berkshire still exists albeit without a county council; this is a unique situation. Greater London was created in 1965 by the London Government Act 1963 as a sui generis administrative area, with the Greater London Council functioning as an upper-tier local government. It consists of 33 local authority districts and spans the area which was prior made up of the County of London, most of Middlesex, and parts of other neighbouring administrative counties. In 1972, no metropolitan or non-metropolitan counties or districts were created in this area. However, the council was abolished along with the metropolitan county councils in 1986. In 1994, Greater London was designated as one of nine regions of England, which each had a government office up until they were abolished 2011. Since 2000, Greater London has had an elected Assembly and Mayor responsible for strategic local government. In the other nine regions, plans for elected assemblies were abandoned (although they had regional chambers with limited functions between 1999 to 2010), leaving London as the only region with a conterminous authority. The area does however include two counties for the purposes of lieutenancies: the county of Greater London (which covers the 32 London boroughs) and the City of London. 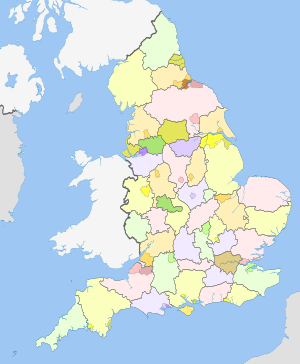 Metropolitan and non-metropolitan counties of England Facts for Kids. Kiddle Encyclopedia.